Telling a story about the good and evil vying to control the Sword of Destiny comes the Angel Blade slot. This uniquely designed video slot is included in an innovative series provided by SG Interactive and Bally. There’s everything to love about this slot, and nothing to hate from its graphics, implemented features, payouts to the betting options. The storyline alone immerses your attention with its 5-reels, 25 paylines, 15 credit bonus bet and 400 max credits. Angel Blade slot is equipped with beautiful graphics with attention to detail implemented into every illustration that embraces the screen. Betting options vary, depending on how much each individual player wants to bet per spin. Angel Blade slot offers a minimum spin for just .40. The minimum bet equals out to be 2 coins bet per line. Since this is a fixed payline slot, bets per line cannot be adjusted. Other options include .80, 1.20, 2.00 and the max 4.00. Symbols included in the game all coincide with how powerful Angel Blade is. Included in the graphics are her powerful Bracelet, Necklace, Sorcerer Book, The Angel herself in two different stances’, and other items from the Sword of Destiny series. Angel Blade rewards with her special powers in the form of free spins and X Zone symbols. Trigger the free games bonus by spinning three or more scattered X Zone symbols. Once the feature is initiated 8 free spins will be rewarded as well as a scatter pay of 2x your total stake. During the 8 free spins, every time a X Zone symbol appears one extra free game is credited. During the free spins there are selected symbols that will be displayed at the top of the screen that will have corresponding multipliers. Every time a matching combination of 3, 4 or 5 symbols are made the winnings from matching up the combination will be multiplied by the progressed multiplier. New multipliers are added to the free games feature with each set, meaning once the current feature is complete and another one is triggered, a new multiplier is displayed. Trigger the Temple Tower Jackpot feature for your chance to win Angel Blade’s jackpot! Three or more scattered Gold Shield Watermark symbols triggers the feature where you must try and climb the jackpot ladder to discover your fortune. The Gold Shield Watermark symbols are smaller than the other symbols, therefore can appear in-between the reels. Once the feature is activated, a ladder with 16 steps will appear. Each step contains different cash prizes ranging from 400, all the way up to 3,000, and three different progressive jackpots. 3 picks are awarded to choose from 20 stones. With each of the three picks 1-6 steps are awarded on the ladder creating a winning path, and of course, you want to get the max 6 steps to quickly move up the progressive jackpot ladder as fast as you can before running out of picks. Individual rewards are rewarded as you complete each step on the ladder. Make it all the way to the top and Angel Blade herself will reward you with one of the progressive jackpots. 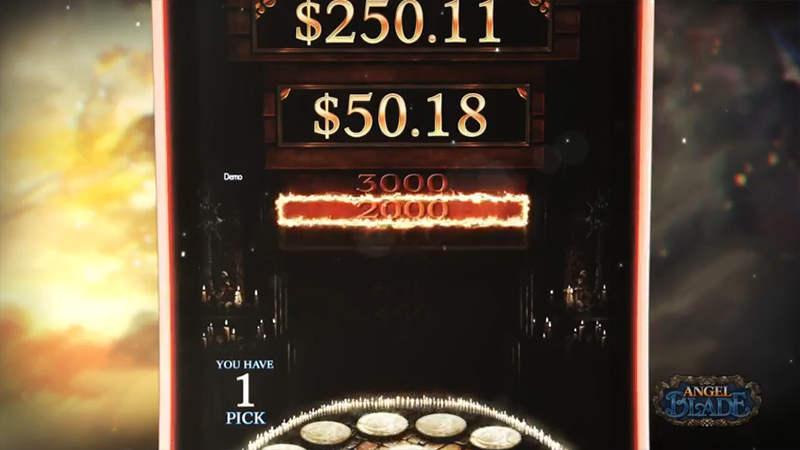 The three tier jackpot level increases with each level. The first jackpot is of smaller value with the second one higher in pay than the first, and the top jackpot is the biggest of the three. Angel Blade slot is picture and bonus perfect! The slot possesses everything a slots player is looking for. When it comes to USA slot offerings, SG Interactive has mastered all the important details of making sure you feel like you are part of the storyline and journey. 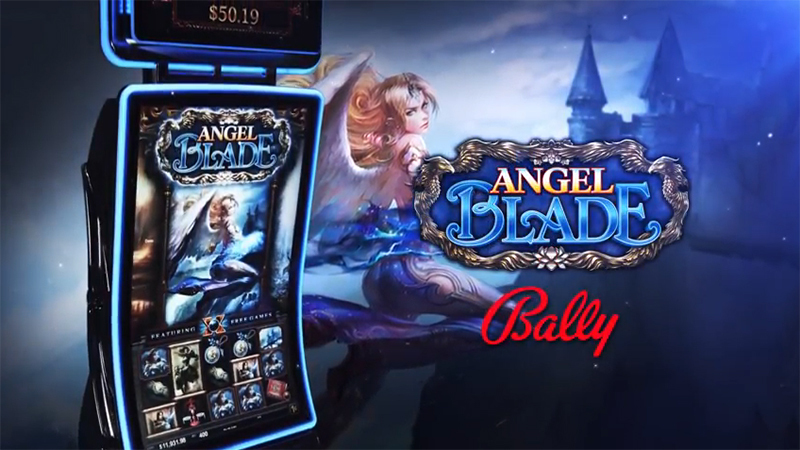 Angel Blade is a must play, and is available to play at land-based casinos throughout the USA that have included SG Interactive games to their casino floor. Angel Blade slot is a new TwinStar J43 release. SG Interactive’s TwinStar Cabinet is a commendable high-tech gaming system that delivers premium game play across a 43” J-curved display with 4K screen resolutions as well as advanced internal ergonomic styling, thrilling audio sounds and effects and an improved iDECK for authentic interaction. It is a brand that is recognized as a cross-branding platform that is a subsidiary for an array of content from several top leading gaming providers such as Shuffle Master, Bally and WMS.